HP Umpire Gerry Davis ejected Blue Jays Manager John Gibbons for arguing a Replay Review decision that affirmed Davis' out call in the bottom of the 5th inning of the Red Sox-Blue Jays game. With one out and two on, Blue Jays batter Devon Travis hit a 0-1 changeup from Red Sox pitcher Wade Miley on the ground to center fielder Mookie Betts, who threw to catcher Ryan Hanigan as Blue Jays baserunner Danny Valencia attempted to score. Upon Replay Review as the result of a challenge by Blue Jays Manager Gibbons, Davis' ruling was affirmed, the call was irrecusable. At the time of the ejection, the Red Sox were leading, 8-4. The Red Sox ultimately won the contest, 12-6. This is Gerry Davis (12)'s second ejection of 2015. Gerry Davis now has 7 points in the UEFL Standings (5 Previous + 2 MLB + 0 Irrecusable = 7). Crew Chief Gerry Davis now has 2 points in Crew Division (1 Previous + 1 Irrecusable Call = 2). This is the 113th ejection of the 2015 MLB Regular Season. 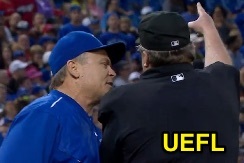 This is the 53rd Manager ejection of 2015. This is the Blue Jays' 5th ejection of 2015, 2nd in the AL East (BOS 7; TOR 5; BAL, NYY 4; TB 3). This is John Gibbons' 3rd ejection of 2015, 1st since June 19 (CB Bucknor; QOC = U [Warnings]). This is Gerry Davis' first ejection since April 23, 2015 (Brad Ausmus; QOC = Y [Balk]).